A native Floridian, Joanne is a widely traveled, published and accomplished freelance photographer specializing in capturing the beauty and splendor of wildlife and nature around the globe. Joanne Williams Photography Workshops & Tours have seen Joanne lead photo expeditions to some of the most remote corners of the globe including Brazil’s Pantanal region, the Galapagos Islands, Kenya, Zimbabwe, Tanzania, Botswana, South Africa, Madagascar, the Caribbean islands, the Falkland Islands, the Pribolof Islands, Central and South America, Alaska and all throughout much of North America. Due to her Florida roots, the wetlands and other wildlife “hot spots” are frequently the focus of Joanne’s lens. While at home in Florida you can find Joanne guiding clients on her Florida Photography Workshops through swamps, marshes and wetlands aboard her fiberglass pontoon boat & her personally-customized Fotoboat, a craft that can maneuver fully-loaded in 6″ of water, allowing you and Joanne access to the wildlife “up close and personal”. You do not have to be a photographer to enjoy her tours. 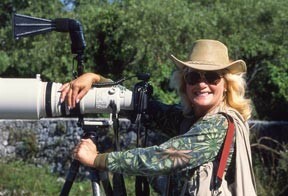 Her photography is seen by millions around the world and appears frequently in numerous publications like Ranger Rick Magazine, The New York Times Magazine, The Sophisticated Traveler, Birder’s World, Bird Watcher’s Digest, Defenders of Wildlife, National Examiner, Audubon Magazine, Time Magazine and numerous educational text books. Additionally, Joanne has been honored with six covers of Florida Audubon Magazine, The Naturalist. She has won numerous “Excellence In Craft” awards as a member of the Florida Outdoor Writers Association (FOWA), an Addy Award for one of her websites, which houses an always-growing library of thousands of stock images, all of which were photographed by Joanne herself in locations across the globe. Joanne has been the keynote speaker at the Kennedy Space Center / Titusville Wildlife & Birding Festival. Joanne claims her proudest moment was seeing her award-winning image hanging in the Smithsonian National Museum of Natural History in Washington D.C., an honor bestowed upon her for being “Highly Honored in Wildlife” by Nature’s Best Magazine. Joanne is an active member of North American Nature Photography Association (NANPA), a contributing photographer to Visual Resources for Ornithology (VIREO) at the Academy of Natural Science in Philadelphia, Pennsylvania. Best Nature Photo – Florida Wildlife Magazine (for Horned Owl with chick portrait). Ranger Rick Magazine, May 2009 – Featured a double-page centerfold of the endangered Whooping Crane which Joanne has spent nearly a decade photographing in its natural habitat. The Naturalist, 2008-2011 – Joanne’s acclaimed nature photography has graced the cover of the Florida Audubon’s Magazine, The Naturalist, an astonishing six (6) times. The Birds of North America, Golden Guides from St. Martin’s Press, 2001. Lakes: Timeless Reservoirs, Randy Frahm, 2003. Woodpeckers, Smart Apple Media, Jill Kalz, 2002. Field Guide To The Rare Animals of Florida, Florida Natural Areas Inventory, 2001. Just Dads: Nerves of Steel…, Willow Creek Press, Bonnie Louise Kuchler, 2002. Just Sweethearts: Wild Thoughts…, Willow Creek Press, Bonnie Louise Kuchler, 2003. Just Moms: A Mother by any Other Squawk…, Willow Creek Press, Bonnie Louise Kuchler, 2006.